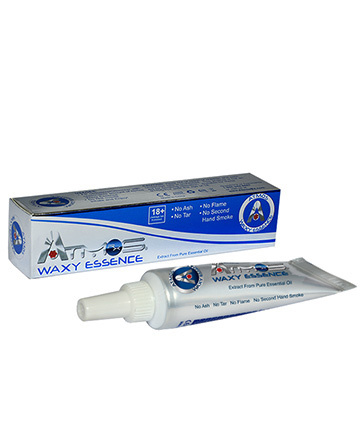 Atmos Wax Consistency Paste is an exceptional alternative for anyone looking to get the most out of their Wax Consistency Vaporizer Pens. Atmos Wax Consistency Paste is packed in small 2.5mg travel sized tubes that make it simple and easy to fill your portable wax consistency vaporizer pens, preventing messy spills and harsh tastes. And each tube of wax consistency paste is carefully crafted to provide the most efficient and reliable performance in Atmos Wax Consistency Vaporizers. Our wax consistency paste comes in both cigar and tobacco flavors that will satisfy your taste for traditional smoke while still providing smooth and potent vapor. All of our best waxy essence are made with the safest ingredients in the industry, so you can rest assured knowing your liquids are of the highest quality. So fill up your chambers and take the plunge into a more satisfying and flavorful world by joining the Atmos Family and trying our critically acclaimed waxy essence in your wax consistency vaporizer, because once you try Atmos high quality waxy essence, you will wonder why you ever tried any other brand.